No winter activity would be complete without specialized gear sledding included. From flying down your favorite hill to pulling freight, there are sleds for just about everything. In northern areas like Alaska and Canada's Yukon Territory, dog sleds are common forms of transportation. In more southern areas tobogganing is a mostly just a fun winter activity. A sled has parallel runners, while a toboggan slides on the snow on a flat surface. Traditional wooden toboggans, from the Algonquian word odabaggan, are flat pieces of wood with the front end curved back. Eskimos used to make toboggans out of whalebone, though today plastic is more popular. Plastic toboggans can be thin and shaped like the traditional wood toboggans, or be a thicker plastic with a rectangular shape and curved up edges. Some styles come with a steering wheel and/or breaks for control. Flying saucer sleds are technically round plastic toboggans. Generally, less expensive, flying saucers are fun because they are more mobile due to lighter weight and the round shape allows the rider to cross their legs more comfortably and hang on while leaning to steer or spinning of control. Saucers come in various sizes including doubles, and more expensive brands offer specialized shock absorbing tubes. Traditional sleds are fundamentally toboggans on runners. Also available in wood or plastic they serve as freight carries, transportation and toys. Hand sleds, pulled with a rope, carry freight and small children. Similarly, freight sleds, often pulled by dogs, transport freight, but can carry more weight and haul people. Many come equipped with a box atop the sled called a backboard. Nordic designed kick-sleds can be hooked up for dogsledding, but also offer excellent aerobic exercise if human propelled. Equipped with a seat for gear or children and rudders to stand on, they ride well on snow packed streets, back roads, and snowmobile trails. Luges are probably the most dangerous style of sled, with minimal steering, and higher speeds. To ride a luge, riders must lie down and preferably have a clear maintained course. Catamarans look like a trampoline on skis, and offer as much steering as most traditional sleds, but the springy seat adds more bounce for those who like a livelier ride. Inflatable inner tubes can be fun in the snow as well. Commercial grade snow tubes can hold up to 350 lbs and are durable on groomed or smooth surfaces. They also ride well on water in the summer. Creativity can save you money. 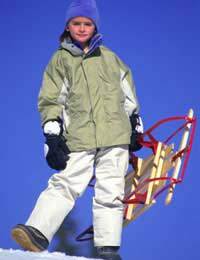 Rather than buying a commercial sled or toboggan, lunch trays, or any other flat surface that slides on snow or ice can be used to cruise down a hill. Wood rudder sleds have old-time nostalgia and with quality manufacturing, can last for generations. However, metal rails can cut if they run over someone, so they are not recommended for largely populated or particularly dangerous hills. Wood sleds also require some maintenance, such as checking the screws. Plastic sleds tend to be lighter and are usually less expensive, though not always the most durable and generally do not offer great control on ice. Speed and control vary with different sled styles, and buyers should be aware that some sleds have weight limits. Also make sure you buy the length necessary to fit all the people who want to sled. With lengths varying from 42 inches to eight and a half feet, you can get one for the whole family or for each person separately. Wherever you sled, down the street, the local hill or at your favorite ski resort, there are sleds for you style, speed and price range. Make friends next time you go sledding to try different styles. And, as with all gear, talking to experts, often shop keepers, will help you make an informed decision. Hello.I'm writing about my childhood winter experiences in Canada throughout the 1960s.There was abundant snow and we sledded on flying saucers.I think that you have flying saucers today in the U.K., but I would like to know if these plastic disc-shaped saucers existed in the U.K. throughout the 1960s. And can you think of any other outside winter activities that kids used to do in North America that they didn't do in the U.K. (throughout the 1960s)? Thank you.